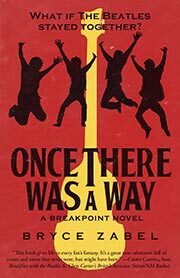 Uchronia: Once There Was a Way: What if The Beatles Stayed Together? Zabel, Bryce. Once There Was a Way: What if The Beatles Stayed Together? Diversion 2017. Zabel, Bryce. Once There Was a Way: What if The Beatles Stayed Together? What if: The Beatles did not break up in 1970. Series note: Although billed as a Breakpoint novel, there appears to be no connection to Zabel's similarly labeled Surrounded by Enemies . Awards: Winner: 2017 Sidewise Award for best long-form alternate history. .